It’s difficult to overlook the clean and slick look well-kept upholstery provides. However, as much as we love comfortable upholstered furniture, cleaning upholstery is not everyone’s cup of tea. The dirt and filth on upholstery not only takes away its pleasing look, but they also make the sofa and furniture all the less alluring. Sadly, keeping dirt away from upholstered furniture is a tough task and can turn out to be a nightmare for most people. Even if you are careful enough to avoid spilling anything on the furniture, dirt as well as dust can almost always find its way between the upholstery. Fortunately, instead of letting go of that expensive piece of furniture (upholstered furniture is generally expensive), there are a few simple yet wholly effective upholstery cleaning tips that can be executed by just about anybody at home. The cleaning process of upholstered furniture varies from fabric to fabric. For instance, the cleaning process will be quite different for a common store sourced sofa in contrast with the upholstery on an antique chair. However, not everybody is adept at discerning the type of fabric, so we recommend checking with the manufacturer and discussing the best cleaning methods with them in advance. In addition, most pieces of upholstered furniture usually have little letters on them which decode the cleaning methods they might require. For instance, a ‘W’ signifies the upholstery can be treated with water based cleaning products. Similarly, an ‘S’ states that the furniture should only be cleaned by professionals. A combination of ‘WS’ means the furniture can be cleaned either by a professional or an individual at home. More importantly, an ‘X’ signifies the use of a vacuum only with no detergents or solvents. If your piece of upholstered furniture has accumulated a lot of dirt and stains, then the best way to clean the furniture is by a vacuum prior to any cleaning. 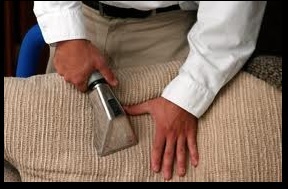 Vacuuming the upholstery will help you get rid of the dirt, which can cause more damage to the furniture when wet. Vacuum cleaners usually have upholstery cleaning attachments that are designed to be used for little crevices and cracks. With fresh spills, the key is time. Therefore, instead of letting the spill spread and get hard to get rid of, it is necessary that the spill be dealt with as quickly as possible. The best way to get rid of the damage done by a fresh spill is by using a white cloth and blotting the surface. Using a white cloth helps keep the area of the spill under control and easier to clean. In addition individuals should never scrub the cloth at any cost. Most homeowners simply do not have the time or skill required to clean upholstery. Moreover, the myriad of choice one has when it comes to detergents and solvents, combined with the sheer types of fabrics on furniture, makes it even harder for one to clean upholstered furniture successfully. Therefore, instead of dealing with the hassle and potentially damaging your furniture, it is best to seek professional upholstery cleaning help. We, at Advanced Surface Solutions, are renowned across the United States for the professional and highly effective surface cleaning solutions we provide. We take great pride in offering highly trained professionals who use state of the art cleaning processes on your furniture to bring back the brand new look once again.